Ms. Kim’s practice includes guidance, advice, counsel and representation for businesses and individuals in matters of immigrant and nonimmigrant visas with a subspecialty focusing on the U.S. Immigration Investor Program (EB-5 Program). She has represented U.S. and international clients, including institutional, business and individual clients pertaining to both employment-based and family-based visas before the U.S. Citizenship and Immigration Services (USCIS), U.S. Department of Labor, U.S. Department of State, and Executive Office of Immigration Review (Immigration Court). Her practice also focuses on American and Foreign corporations and individuals seeking to make investments under the Free Trade Agreements (FTA). Her current focus is the U.S.-Korea FTA. She also provides resources and advice on global migration and immigration for professionals seeking employment abroad and for multi-national companies managing the immigration process for their employees worldwide. In addition to establishing herself as an expert in matters involving immigration law, Ms. Kim is actively involved in the legal community and in the domestic and international business community. 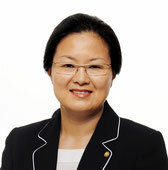 She serves as a member of The National Unification Advisory Council, a constitutional institution, to the President of South Korea, as a board member of the Korea Southeast U.S. Chamber of Commerce, and as an advisory legal counsel to the Federation of Korean Associations of the Southeastern U.S. where an estimated 200,000 overseas Koreans reside, including Georgia, Alabama, Florida, North Carolina, South Carolina, and Tennessee. Ms. Kim has been involved in numerous international and regional civic organizations, including Rotary International (in both South Korea and Alabama, USA) and L’Arche, an international federation of communities for people with mental and physical disabilities. She was the very first Korean member of the Jesuit Volunteer Corps, which supports organizations providing direct services to poor and marginalized people in the U.S. and internationally. Ms. Kim was born and raised in Korea. She came to the United States to pursue her education, earning her BBA in International Business from The George Washington University in 1998. She was awarded her JD from the University of Maryland. Prior to attending law school, she pursued a career in international business. Ms. Kim is admitted to practice in Alabama and is eligible for admission in the District of Columbia. She is a member of the American Immigration Lawyers Association, American Bar Association, Alabama Bar Association and Mobile Bar Association. Ms. Kim’s personal experience as an immigrant, in addition to her legal and business background, gives her a unique and practical perspective that allows her to provide services with a sense of resourcefulness and with compassion for her clients.